← Gay Marriage in California! 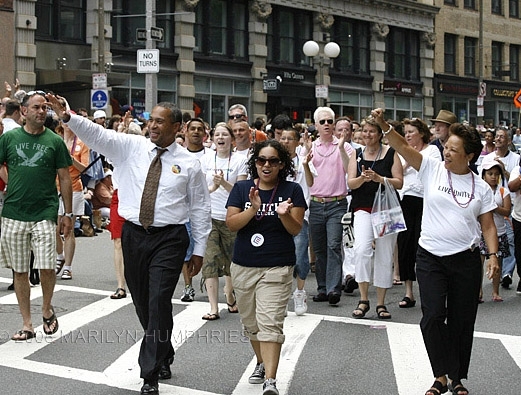 The First Family of Massachusetts raised the celebratory level of the 2008 Pride Parade in Boston to dizzying new levels. During Pride Week, the Patrick family showed enormous grace, leadership, and love as the political met the personal. In a vacuum of national leadership on marriage equality, governors, and sometimes their families, can and must lead the way. How wonderful to have a father like Governor Patrick. How different from our Vice President who also has a lesbian daughter. In the past, alot of parents felt bad about having gay children because it meant that their children couldn’t participate in the family tradition of marriage and having a wedding. It meant that the parents would never be the proud parents of the bride or groom. The parents of gay children often worried about their offspring’s future happiness and social stability. Now in two states parents can know that all their children can legally celebrate their marriages. I’m glad to live in one of those states. Now I want to live in a country where the national government also recognizes all marriages. Arthur, Parents really do want their children to have only the best. The best will mean all the rights and privileges of full American citizenship. We are still waiting for that day!